It’s safe to say that when it comes to Fall, Pumpkin is the superstar of the season. From adorning our doorsteps to filling our lattes, muffins and more, we just can’t get enough of this bright orange gourd. 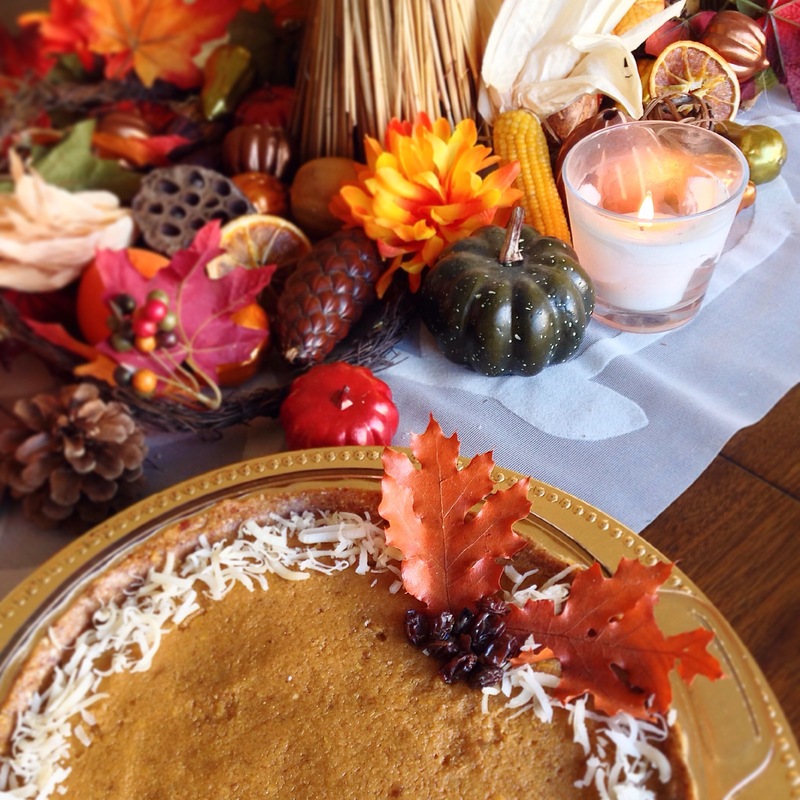 Maybe that’s why every holiday doesn’t feel complete without atleast one pumpkin pie on the table. But for those of us who can’t handle the high saturated fats of a gluten-filled crust, heavy cream or tons of processed sugar, we can be forced to do without our precious pumpkin fix. Until now! 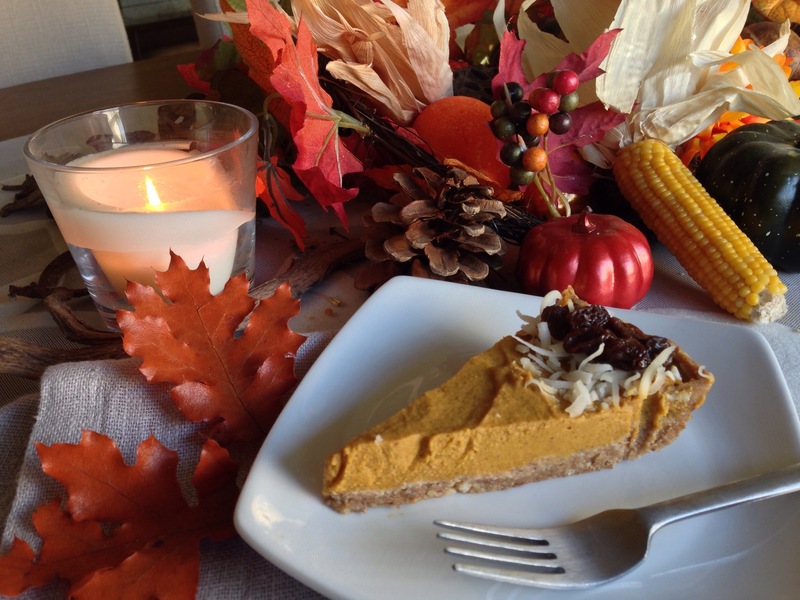 Enter my raw-fully delicious, twice as nutritious, living Easy No-Bake Vegan Perfect Pumpkin Pie that’s guaranteed to please! Aside from tasting great, Pumpkin is shown to increase immunity, eye sight, younger looking skin and even aid in weight loss. How’s that for a healthy tasty twist! Using your 9 inch pie pan as a guide, cut out a circle the size of the pie pan and 2 long strips out of the parchment paper. Make a cross with the strips and lay them across the pie pan, setting the circle on top of them. Set these aside until you’ve finished the crust. Next, place the almonds and cashews in your high-speed blender and grind until blended thoroughly. Then add the dates, raisins, coconut, and sea salt and blend until it begins to form a ball. Remove the mixture from your blender and using a spatula, spread it on top of the parchment paper until it covers the entire inside of the pie pan; pressing firmly and smoothing as you go. Once the crust is set, place it in the fridge to firm. With a clean high-speed blender, combine all of the filling ingredients except for the shredded coconut and mix until a smooth and creamy. Once blended, remove your pie shell from the fridge and pour in the filling. (You may have extra filling that you can freeze for another time.) Smooth the top layer of the filling with the spatula and sprinkle with top the shredded coconut as you please. Place in the fridge for at least 3-4 hours to set; I recommend overnight, if possible. This recipe is best made the night before your intend to serve as the flavors combine beautifully once they’ve had some time to settle together. When it’s time to serve, slice and plate immediately as with any other pie but do not remove the parchment paper from the pie pan as the crust is super sticky. Any remaining pie should be refridgerated and will keep for approximately 5 days. Although this Easy No-Bake Vegan Perfect Pumpkin Pie is so delicious, I doubt it will last that long! UPDATE: You can find a step by step video of my completely raw version of this recipe and many more now in LIVING HEALTH Magazine! Previous post Savory Mac & Cheese Cupcakes, Please!